Stay cozy all year with this white cotton-blend comforter that looks great with your current decor. With a 250 thread count and a 100 percent cotton cover, this all-season down comforter has a plush feel that helps you rest comfortably. This comforter is filled with a blend of down and feather to help you stay warm while you're sleeping. I was concerned after reading a few reviews that I might be disappointed in the comforter's lack of 'loft' (AKA fluffy-ness). However, I think what those reviewers failed to do was thoroughly fluff the comforter before use. You need to really beat the living heck out of it after removing from the package or it will be quite flat. I mean seriously shake, fluff, beat, snap, shimmy. Once I did that, the thing has lots of loft and quite resembles the product photo. It's very warm - perhaps only suited for the cooler months. The only reason it lost 1 star from me was the smell. It does have a fairly strong gamey smell when you remove it from the packaging. I've had other down comforters and not remembered this strong a smell. I aired the thing out for two days and the smell lingered. Finally, a few shots of Fabreeze is what worked and the smell has not returned (or, at least I don't notice it). A solid product and a great value - recommended. I bought this comforter for my mom. It is not easy for her to get warm when she is sleeping, especially in the winter. Winter is coming, and I want to give her a warm winter! Thanks to this comforter, she has had a great sleep every night! She told me that this comforter is very warm and comfortable. I'm so happy to hear that she loves this comforter! Now I will buy another one for myself since my mom highly recommends me to do so! I was a little worried when I saw how small the package was containing the comforter. It appeared very thin and lightweight. Having used it for several weeks now, I can say that it is a dream! Very lightweight, yet very comfortable in regard to warmth. If I were to buy one again soon (I don't think I will need to) I would probably buy an "oversized" comforter. My duvet has a extra few inches on each side. Fortunately this has not affected the comfort and warmth of my nights! Because it is so delightful, I gave it all 5 stars. I do not yet know about durability. Time will tell. As for now, I am very pleased with my purchase. I just got the down comforter last week. It is super comfy!! It is the perfect weight. I live in Florida, we have had a cold winter this year & it has kept us so warm! It also feels light enough to use during the summer. A great year round comforter! I ordered it along with Capri Printed 400 thread count duvet cover set & matching sheets. Wow!! My bed is now a little slice of a billowy heaven. Every girls dream come true, not to mention my husband's too ;) LOVE IT!! Already recommended it to 2 of our friends, and now to all of you. What a great deal! ive always had trouble finding a comforter that is perfect but this is exactly that!!!! it fits in my washer and comes out looking new every time.. . . .the only downside is its al lil bit small. . . .if u have a queen size bed u may want to consider getting king size. . . .but other than that its GREAT!!!! The perfect warmth weight for all seasons! Soft cover, and great even distribution of feathers. I am very pleased with this comforter. I am usually either too hot, or too cold, and this has been perfect. Some of the squares are not as full as others, but I have not had any problems with lose feathers, there is no unplesant odor and it is super comfy! And to think I almost bought one for 3x the money! The comforter is very comfortable and a great temperature. I removed it from the package a month ago and put it on the bed, and it hasn't really fluffed up much, but it still is comfortable. 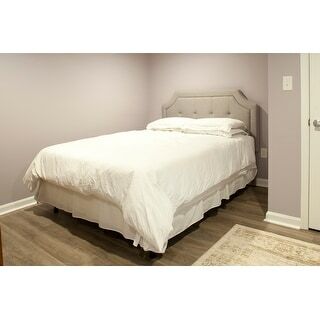 This was just what we were looking for our guest bedroom.Rarely used but good appearance, very good price. This isn't the thickest duvet but it is still very warm and comfortable. I bought a full/queen size and it was more than large enough for my daughter's full size bed. Love it! Snuggly and warm. Great comforter, perfect temperature for a moderate climate. The only complaint is that even though it was pocketed the fill seemed to move around more than expected. Perfect weight and no bulking up of feathers as of now. I use this comforter year round, usually with an added blanket underneath in the winter. Highly recommend! Love this comforter! Has kept its shape, has been dry cleaned and is as soft and comfy as the day i first used it. Would definitely purchase this again! I still have this comforter and still use it at almost 10 years old. I would love to find another one. great comforter. not too heavy or too soft--feathers nicely distributed. For kids who can be cold in the summer and not too cold in the winter. "Does the comforter have duvet ties in the corner so that it won't slip inside a duvet?" hello Mobyzoe, this does not have ties. Thanks for shopping with us! "How big is this in its package?" Hello gjafrica, our information shows the shipping dimensions are 7 inches H x 18 inches W x 21 inches L. The shipping weight is 8 lbs. Thank you for shopping with us. Thank you for your question scarlet12345. The Cotton 250 Thread Count All Season Warm Down Blend Comforter is made in China. Have a great day.